Jamzz is a Kodi Addon that is all about music. Sections include Heavy Metal, Classic Rock, Alternative, Hair Bands, and Search. Skull Rock is a Kodi hard rock music Addon from Vikings Repo. Sections include Concert, Clips, AD/DC, Aerosmith, and more. KNE Rock is a Kodi Addon that streams music videos. It has many sections including Best Full Concerts, Rock Videos, Classic Rock, Pop Hits, Hard Rock, Alternative and more. T2K IPTV Kingdom is a new Kodi Live TV Addon from T2K Repository. The main menu has sections for Mobdro Live TV, Live TV, Fluxus, TV channels, UK, US, 24-7, Lodge TV, Stratus and more. It has combined many top Live IPTV plugins into one Add-on. If one plugin does not work there is others to use. That Broke Mallu (TBMV2) is a Kodi Live TV Addon T2K Repository that has been updated to version 2. It has sections for Sports, Entertainment, News, Cooking, Music, Kids, Religious, Movies, Documentary, French, Australian, Filipino, German, Portugal, Italy, Canada and more. So far it is working very well and a good Live IPTV Kodi Addon. Chronos is a Kodi Live TV Addon from Skydarks Repository. It has sections for Live TV, Austria, Sports Direct Links, Live Sports, Hg Sports, Hunting/Fishing, Concerts, Movies, One-click Movies, YouTube, 24/7, Search and more. It is a good add-on that so far has been working very well including the One-click Movie section. ULTRA TV is Live TV Streaming Kodi Addon located in the AJ Builds Repository. Sections include Documentary, Food, Kids, Movies, Music, News, Religious, Sports, and UK/USA Channels. Tap TV App is a new IPTV Kodi Addon from Bookmark Lite Repository that has live streams. Categories include Documentary, Food, News, Movies, Music, Religious, Sport, and UK / USA Channels. Live 24/7 is a Kodi IPTV Addon from Digital Repository. Sections include UK TV Now, Live Net, TV One, 24/7 Movies, Shows, Random, Sports, and Replays. It combines many popular live stream options into one Addon. 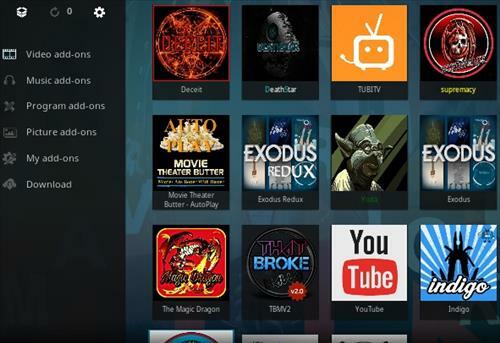 Oblivion Streams is a live Kodi TV Add-on that streams from many sources. It is an older Addon from Oblivion Add-on Repository that has been constantly updated. It has a lots of live streams divided into sections including Shadow.Tv, IPTV Auto, Pot Luck, Free View, Sport, 24/7 Live Shows, Fishing Master, Keeping Fit, 24/7 radio, Karaoke, and more. SGTV is a Kodi Live TV IPTV Addon from SG Wizard. Sections include UK TV, Back Up Channels, Various Sport, Boxing, Movie Mix, and Adult Section. Hard Events is a Kodi Addon that streams live events both past and new. It mostly has festivals and concerts feeds but also has other streams. Flecha Negra (Black Arrow) is a Kodi Live TV Addon from Kodiazor Repository. It has many live streams mainly spoken in English with subtitles from around the world. TV One is a Live TV Kodi Addon located in the Sandman Repository. Sections include Documentary, Food, Kids, Movies, Music, News, Religious, Sports, UK / USA, and more. Infinity Legion V New is an IPTV Kodi Addon from Android Repository. Sections include Albania, Turkey, USA / UK, Scandinavia, World, and more. cCloud TV is a live streaming plugin that has been available for awhile and has been steadily updated. Kodi and Live TV is a bit of a hit-and-miss but is improving all the time. cCloud is an Add-on that has improved greatly overtime with many good Live TV streams.